Based in Cape Town, South Africa, one of the most beautiful cities in the world, our adventure tours in Cape Town provide made to order adrenaline pumping activities to suite every taste. 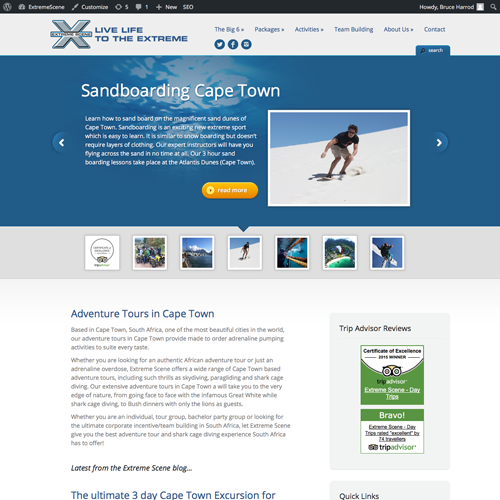 Whether you are looking for an authentic African adventure tour or just an adrenaline overdose, Extreme Scene offers a wide range of Cape Town based adventure tours, including such thrills as skydiving, paragliding and shark cage diving. Our extensive adventure tours in Cape Town a will take you to the very edge of nature, from going face to face with the infamous Great White while shark cage diving, to Bush dinners with only the lions as guests.